Before hauling the car off to Auto Specialty for its rebirth, we added a 4-inch cowl-induction hood from Cervini’s Auto Designs. The extra-tall hood gives the car that racy look, yet remains under the 5-inch legal limit for Real Street hoods. Cervini’s gear isn’t the lightest stuff around, but the fit and finish are excellent. 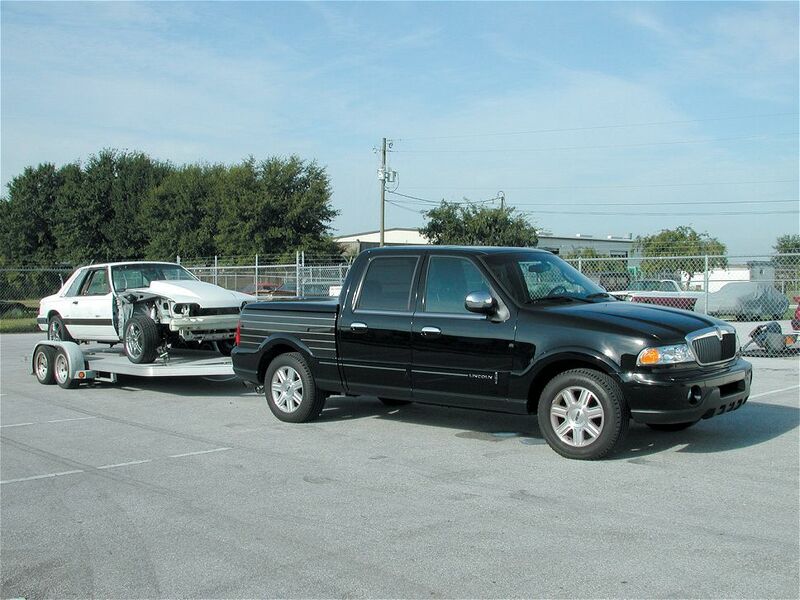 To get Project Real Street from Lakeland, Florida, to Longwood, Florida, we borrowed a now-extinct Lincoln Blackwood from the Ford press fleet. It proved a fine tow vehicle, especially with our light aluminum trailer and stripped chassis. At this point, Project Real Street was our version of a body in white. We stripped off the lights, the fenders, the nose, the trim, the interior, the drive-train, and anything else that might hamper a quality paint job. 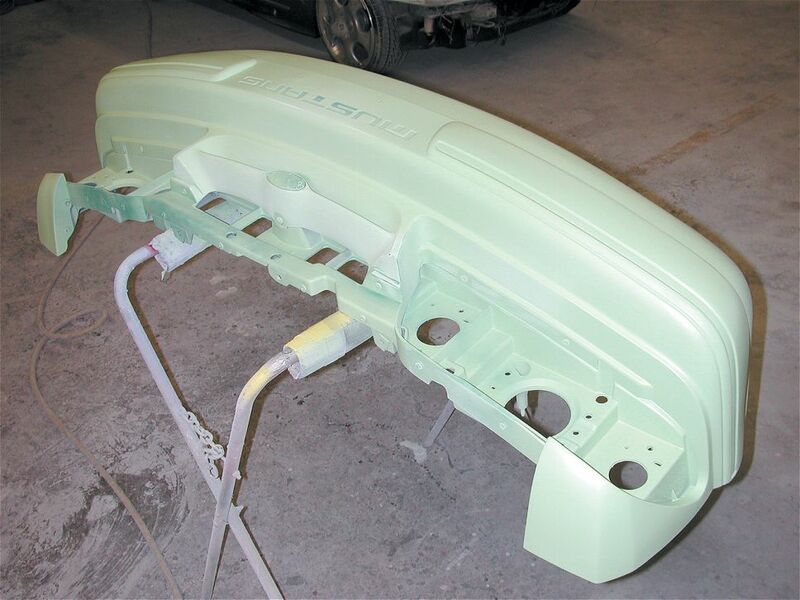 Auto Specialty painted every removable body panel of the car so every nook and cranny on it would reflect the color change. House of Kolor is a huge proponent of using its entire system of products to achieve the best results. Here our Mustang’s nose had its nicks filled in, its surface sprayed with Epoxy Primer-Surfacer (KP-2CF), and the primer sanded to a paint-ready finish. The entire car received this prep treatment by Larry Hansen. 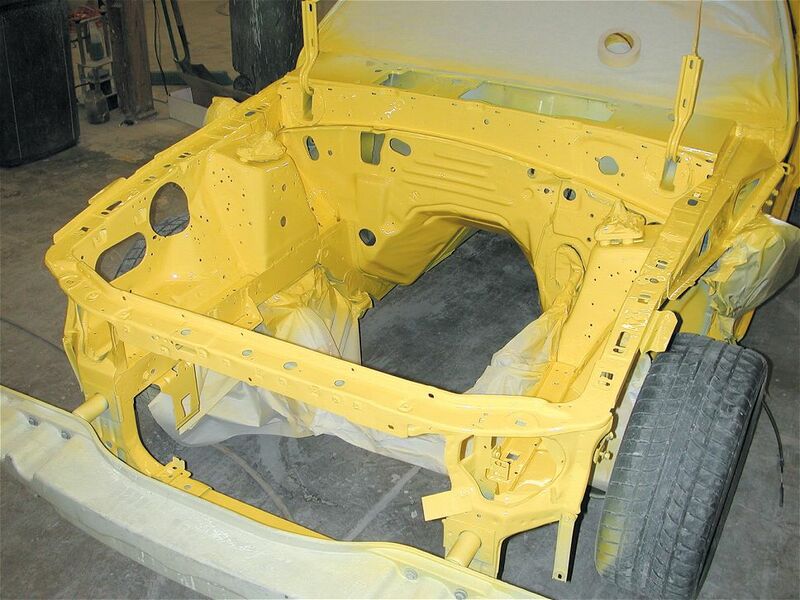 With the prep work finished, Kevin, Patrick, and the Auto Specialty crew began laying down the brilliant Lemon Yellow basecoat. As you can see, we stripped the car down to the bare essentials before the painting began. If you want a top-notch color change or custom paint job, you’ll have to strip your car down this far too. The same goes with the interior. 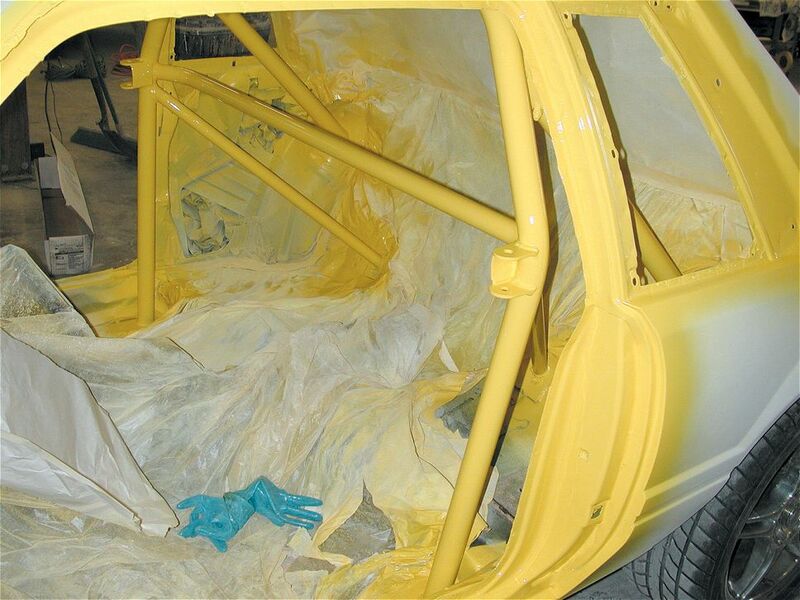 We wanted our Maximum Motorsports rollcage sprayed to match the primary Lemon Yellow on the outside of the car. As such, we removed the dash, the seats, the carpet, and the trim panels before taking the car to the paint shop. 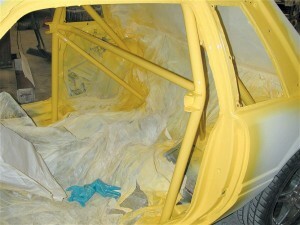 The cage received the same priming and prep as the exterior of the car. You can tell our custom job required several different House of Kolor paints. This is just a sampling of the list. 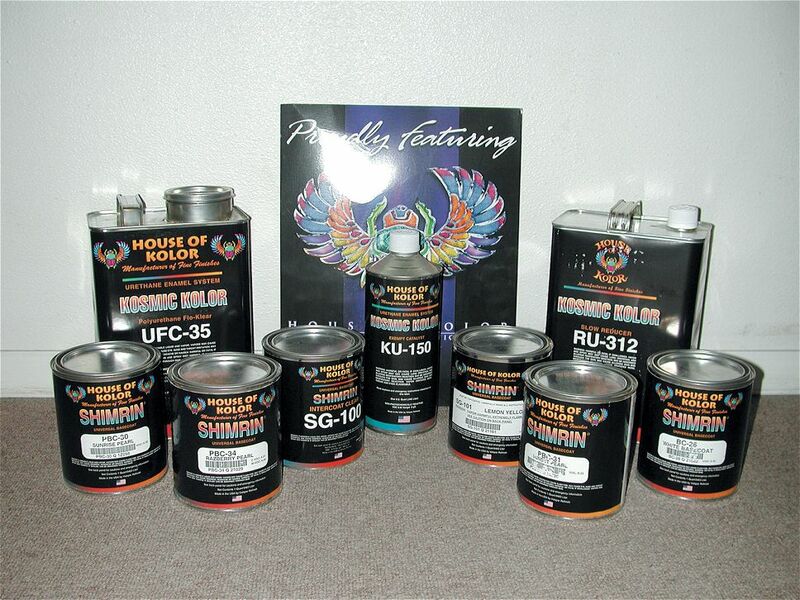 Kevin sprayed our ride with Lemon Yellow (SG101), White (BC26), Sunrise Pearl (PBC30), Sunset Pearl (PBC31), Raspberry Pearl (PBC34), Intercoat Clear (SG100), UC-35 Clear, and UFC-35 Flow Clear. Kevin sprayed project Real Street with multiple coats of clear for durability and shine, but the clears on the flames were laced with HOK’s Ice Pearls in Gold and Red. The Ice Pearls add a multi-color glitter effect to Kevin’s flames.